GTM-Trek! OceanTender is the home of the Free Tendering tool. With our experts, this best in class Response Manager Solution was built in conjunction with shipper and carrier stakeholders. Our mandate is to standardize the tendering processes and introduce efficiencies thereby enabling shippers and carriers to complete their tenders and responses in a timelier manner. The tools and processes are simpler for all participants. Shippers requiring sophisticated 'analytics', can upgrade to OceanTender's Scenario Engine, which offers the ability to review responses, services, routing and carrier performance. Use Ocean Tender to manage your bid process. Reduce you in house resources by 50%. Eliminate Manual Labor, Retrieve Historical Tender Data. Better data accuracy and reliability. Instantly Transmit requests, counters and awards to Carriers. Auto-upload carrier responses and manage your tenders online. Capture all responses independently . Compare responses by total, trade lane, business unit or location pairs. Leverage your rate data history to compare trends. Automatically populate Freightgate's rate database with your tender Awards. Re-use past tenders with ease for simple resubmission with updated volume. Management reports on a field and corporate level in order to ensure timely completion. 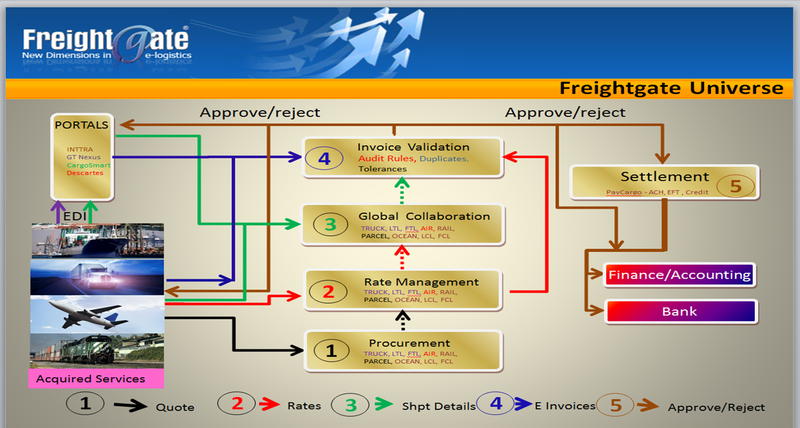 Export functions for the consolidated rates into the target format. Incorporate carrier performance into analysis and metrics . Ensure you have the right mix of services and prices. Reduce Transportation Costs, customers have saved 15% of their spend. OceanTender - The only web enabled transportation performance tool. OceanTender - Design and receive proposals using industry standard formats. OceanTender - Carrier neutral procurement tool. OceanTender - The only available DIY Secure transportation tool. OceanTender - The only solution built with all the help of all Stakeholders, Shippers and Carriers. OceanTender Wizard Shippers requiring point and click 'analytics', can upgrade to OceanTender's Wizard, which offers the ability to review responses, services, routing and carrier performance. Ocean Tender integrates with Freightgate's Universe to provide a comprehensive Global Sourcing tool that takes the complexity out procurement of global transportation services.